Located in Texas, this wilderness area is spread across a stunning 13,229 acres of land. It’s a designated space assigned by the US government. During its earlier years, Upland Island Wilderness was not seen as a collective area. However, with time, conservationist Edward C. Fritz was able to convince the US government to come up with key designated wilderness areas around the nation. 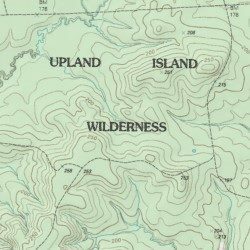 They were able to name five, and one of the first ones was Upland Island wilderness. Here’s more on the wilderness area and what it has to offer those who walk through it. In its earlier years, it was filled with pine trees, and that was its defining feature. While it didn’t have a name at the time, it was famous for its pine trees. Loggers from all over the area came to collect the natural resource. In 1930, the area was stripped to its limit as all of the pine trees were gone. As time went on, the US government and an estate attorney worked on the wilderness area and brought it back to life. It is now thriving and is home to numerous species including pine trees. Who takes care of Upland lsland Wilderness now? Ever since it has been brought back to its original state with pine trees and other related species, the wilderness area is left untouched. It is kept as is since it’s protected land and no one can work on it or take the natural resources for commercial use. If necessary, the Forest Service is responsible for the Upland Island Wilderness. In most cases, the heavy regulations in this area ensure it remains as it is and doesn’t have issues involving resource stripping. The Forest Service is stringent about how the area is controlled from end to end. How is the Upland Island Wilderness spread out? The layout is balanced with Cypress Creek, Oil Well Creek, Salt Branch, and Graham Creek having water running through the area. There are several trails spread across the region too. These trails are varied in size and tend to disconnect in places. It’s important to note the wilderness area is renowned for more than its tall pine trees. It is home to numerous species such as the palmetto flats, pitcher plant bogs, hardwood forests, and more. All of these come together to create the robust Upland Island Wilderness that is state-protected.